Nikki Tibbles is one of Britain's most celebrated luxury florists, renowned for her luxurious hand-tied bouquets, high profile weddings and events and for her green projects for interiors and gardens in private homes, hotels and restaurants. In 1993, she established her Wild at Heart stores in London, where she proposes her visionary and eclectic approach to floral arrangements, always closely tied to the seasons. She is setting up her newest boutique, WILD, at The Coal Office, the new headquarters of famed British designer Tom Dixon, in King’s Cross, London (link), transforming the first arch of Tom Dixon's flagship store into an extravagant floral display and shop. As part of the refurbishment of The Coal Office by David Morley Architects inside an architectural complex dating back to 1851, Tom Dixon fitted out the interiors, deciding to maintain the spirit of the industrial origins with exposed brickwork and light wood or black stone floors. Which forms the perfect backdrop for the new WILD shop that opened yesterday, 1 November 2018. What you can find here is a selection of indoor and outdoor plants, seasonal cut flowers and foliage, as well as hand-tied bouquets, all sourced and created with the distinctive touch of Nikki Tibbles Wild at Heart and sitting amongst the furniture and lamps designed by Tom Dixon. Living up to its name, WILD encourages visitors to immerse themselves in an oasis of nature and design. So, if you live in London, or you're just passing through, and you want to explore the ways in which design and nature connect, then this is the place for you. 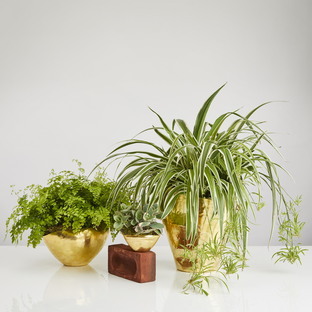 You can expect a plethora of plants inspired by an overgrown jungle, each appearing to take on a life of their own, adorning the brickwork of what has become a landmark of industrial archaeology expertly curated to sit amongst Tom Dixon’s furniture, lighting and accessories.